Don't Wait for the Honeymoon! Reasons Why You Should Go to Tahiti Now. - Holy Smithereens! Without a doubt, Tahiti is one of the most popular honeymoon destinations in the planet. Even A-list stars and celebrities go to Tahiti for their own honeymoon. Movies like “Couples Retreat” further emphasise that Tahiti is a couples destination. Is Tahiti purely a honeymoon and couples destination? Absolutely not. I first visited Tahiti four years ago with my husband. We were not on a honeymoon but we had the time of our lives. A few weeks ago, I was fortunate to visit Tahiti once again. This time, I travelled with two other ladies. I had the time of my life, and dare I say it — Tahiti is definitely not just for honeymooners. Tahiti is always a good idea. 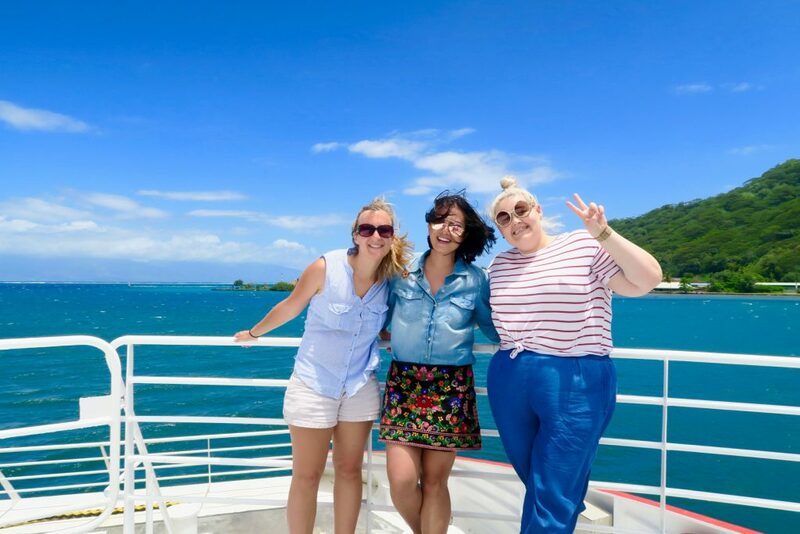 I went to Tahiti with Townske and the Tahiti Tourism Board with one goal : To eat our way around the islands of Papeete and Moorea (and have fun in between). I’m glad that I was able to not only indulge in such amazing Tahitian food around the islands, but also to be able to experience its culture through food and its people! I’ve written a Townske guide about my unforgettable Tahiti food experiences (do check it out). I certainly had an amazing time getting sunburnt, lost, and amazed at all things that Tahiti and her islands had to offer. 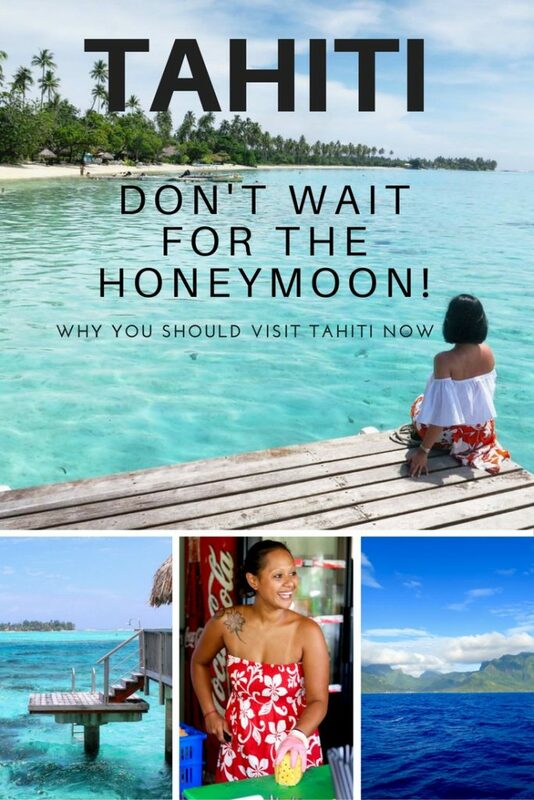 Many people “save” Tahiti for their honeymoon, regardless of whether they are in a relationship (or engaged) or not. While I understand the reason behind this, allow me to encourage you to not wait. 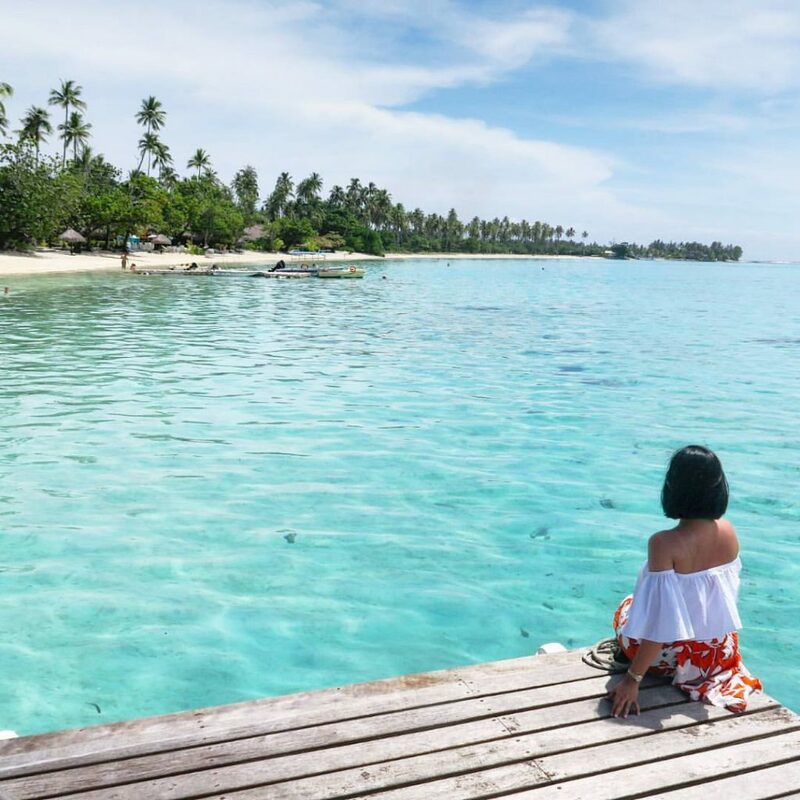 The islands of Tahiti offer way more than just overwater bungalows and romance in the air, and here are the reasons why I think you should plan a non-honeymoon trip to Tahiti, and why I think it’s an ideal destination for women travellers. 1.) It’s okay to get lost. It’s okay to get lost in Tahiti. And get lost you will.One of the many, many things I love dearly about Tahiti is how far removed it is from the topsy-turvy urban life that I know, and I say that as a very good thing. And one thing that Tahiti doesn’t seem to have much need of are road signs. We hired a car and drove around Papeete and Moorea. On our first days in each island, we ended up driving around in circles and getting lost. But it’s also through these situations that we were able to experience how genuinely helpful Tahitians are. On the night we arrived (close to midnight), we found ourselves tired, lost, and a little frustrated as we tried in vain to find our hotel. We stopped our car to re-gain our bearings. Two cars, all ladies, at close to 2AM in the middle of a deserted road. Then a car appears and stops next to us. A local husband and wife who asked if we were okay. They ended up driving to our destination, with our two cars trailing behind. The route was definitely out of their way and as we thanked them profusely, they shrugged it off like it’s no big deal. And this seemed to set the atmosphere it Tahiti. We didn’t have GPS or Google Maps. Just a plain old printed map that had been creased a dozen times. Whenever we thought we’re lost or late to our next appointment, everything irons itself out in the end, our mini surge of stresses gone and forgotten. We never once felt threatened or in danger while we were getting lost, even in the middle of the night. The Tahitian Mana* embraced and took care of us. Most island and resort destinations I’ve been to serve bread and pastries that are, to say the least, forgivable. And the highest quality of bread you would only find in certain five-star resorts. In Tahiti, bread is the ultimate king. Perhaps due to its French influence, all of Tahiti make bread really, really well. Even a humble road-side stall or mini-bakery sells top notch pastries. They also do desserts spectacularly. Nothing over the top or in humongous servings, but every piece is made from quality chocolate, cream or fruit. The first photo above is a dessert I had in Le Mayflower, one of Moorea’s finest restaurants. It’s a Snickers Ice Cream Bar! If you watch my video, you will also see that they serve profiteroles the size of burgers (but its not just the size, its the quality too). And I know I always joke that calories do not count when you’re having fun, but seriously- I seem to eat a whole lot in Tahiti and miraculously end up losing a little bit of weight! This also happened on my first visit. Coupled with the fact that we seem to be active every single day (on top of our eating), I think it’s all up to serving size and quality. When you are served something that tastes way beyond your expectation, you are far more satisfied and do not reach for a second or third helping of dessert. I find that this tends to happen in places with mediocre food as I keep trying to find that one dish that will wow me. 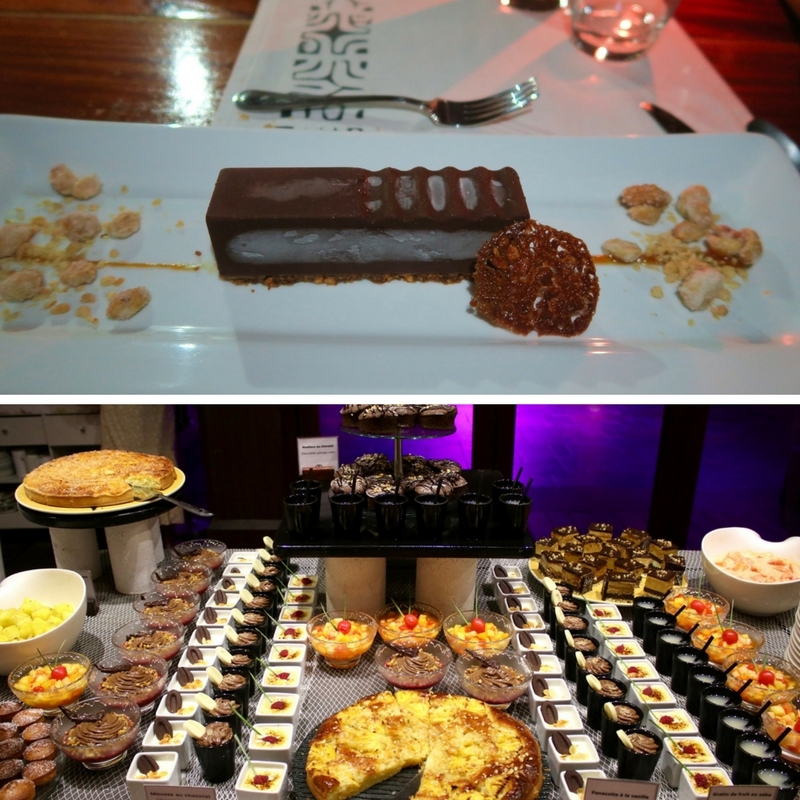 The second photo above is just from one tiny section of Sofitel Ia Ora Moorea’s extravagant dessert buffet. I guarantee that if you pick any dessert with your eyes closed, it will be the best mousse, pannacotta or revel bar you’ve had in ages. 3.) They have wonderful female role models. If you are after fine dining, wonderful seafood and even lovelier desserts, Le Coco’s Restaurant in Papeete is a must-visit. We fell in love with their rasperry and triple chocolate dessert (bottom left in the photo), but when its creator, Pastry Chef Benedicte entered the room, we were even more smitten. Vibrant, sprightly, and with an infectious energy about her, Benedicte’s eyes sparkle with excitement when we talk about her two greatest passions: seafood and chocolate. A wonderful woman after my own heart! Benedicte used to be a model in her younger years, but deep inside, she always wanted to be the creator behind the scenes. She has been happily creating Le Coco’s absolute to-die-for desserts since 2008 , a job she doesn’t see as work. Considering herself to be a citizen of the world, she draws inspiration from her travels in creating her desserts. Oh Benedicte, if you jump (in chocolate), I certainly will jump too. 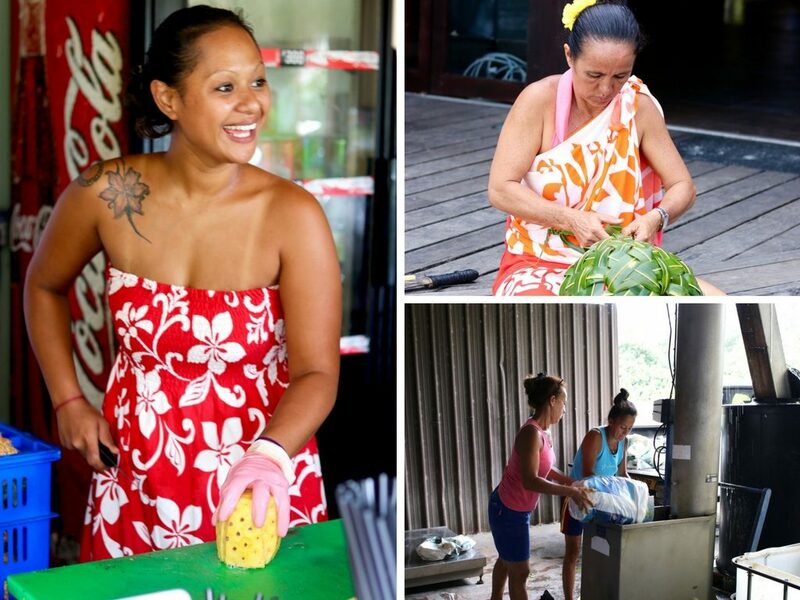 Evy Hirshon, a local Tahitian chef specialising in Vegan dishes. Bottom left photo, Evy during her younger years. Evy Hirshon is one of those people whose very presence seem to have a calming and healing aura felt by individuals around her. We just got off a very wavy boat ride back to Papeete from Moorea, and were still a little bit shaken when Evy welcomed us into her own home. She gave us a welcome drink, a very natural mixture of tumeric, ginger, and other wonderful healing herbs that immediately took all seasickness away. Born and raised in Tahiti, Evy has lived all over the world, and it was during a trip to the local market while she was living in Africa that inspired Evy to become vegan. She is passionate and well aware of current eating habits that Tahitians have that propelled Tahiti to have one of the highest diabetes rates in the world. She goes to local schools educating children about proper diet and healthy living, promoting the use of local Tahitian produce. We were fortunate to have lunch in Evy’s very warm and cosy home. 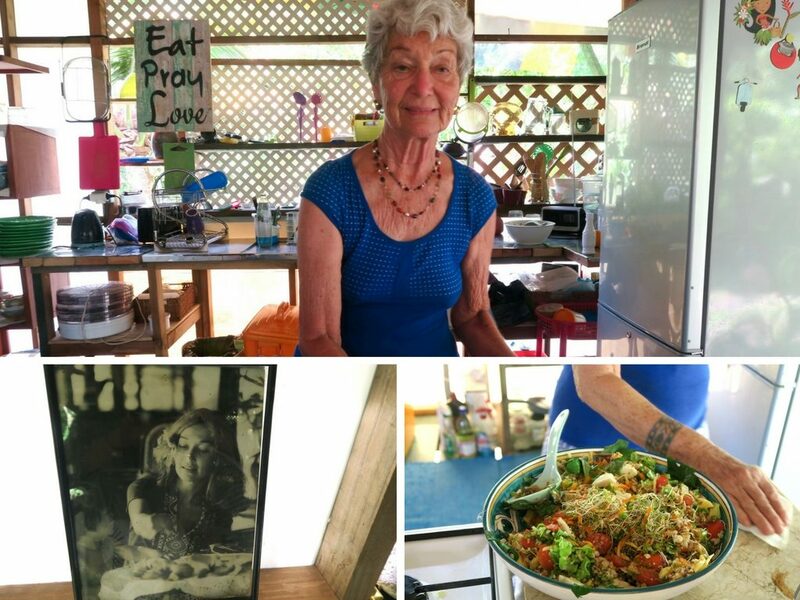 She prepared a raw vegan lunch for us using only local ingredients. And it was the most refreshing and comforting lunch I’ve had in a long, long time. 4.) Gender equality in Tahiti is pretty high. Not only are the women of Tahiti stunning and physically beautiful – they also carry a quiet ease and confidence with them. Women play a great role in Tahitian society and I observed that there’s a pretty high gender equality in the workplace. In general, Tahitian culture is very open and accepting to all genders. When I was there in 2012, I even attended Miss Poehine, Tahiti’s Annual Transgender pageant. This pageant wasn’t treated like drag at all but with pure respect. When a society is accepting and respectful of its women, female tourists are less likely to be in danger themselves. I personally have never experienced catcalling nor felt any sort of unease in Tahiti. This is one of the main differences in Tahiti compared to its neighbouring or other resort destination counterparts. 6.) The water and marine life is mega-fantabulous-amazing. Happy fish = happy travellers! 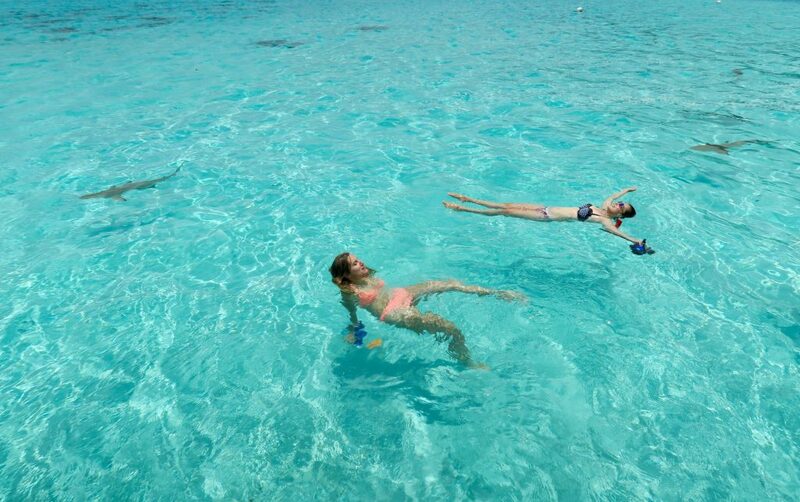 The good news is, you don’t even need to travel far to have an amazing marine life experience. 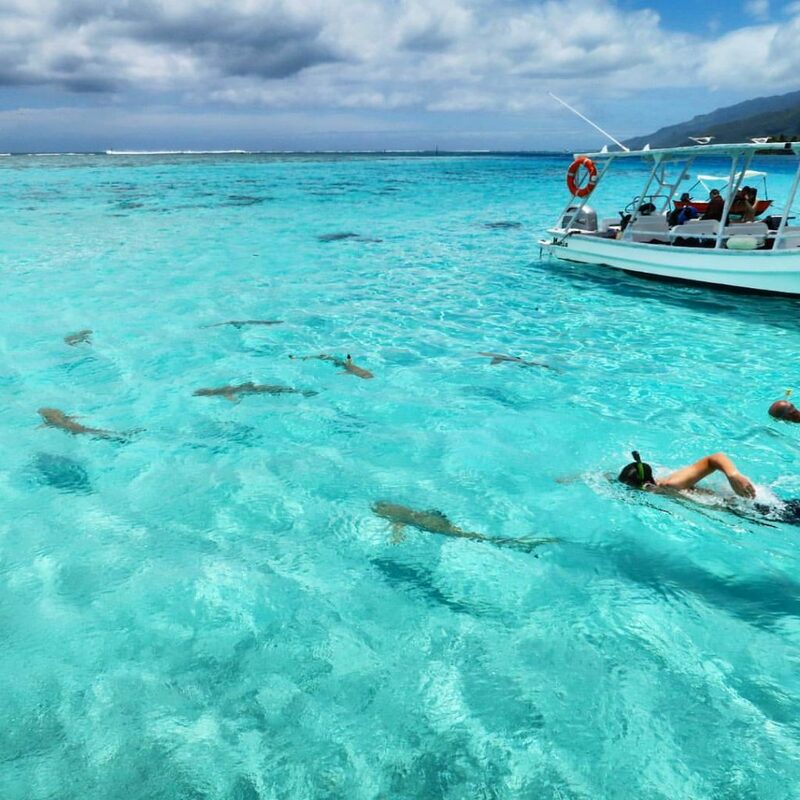 Moorea is just 20 minutes by ferry from Papeete and we did a day trip to a lagoon where we swam with sharks and sting rays. Granted, Tahiti is not the only place in the world where you can swim with sting rays and sharks but let me tell you that the fish (and marine life overall) in Tahiti seem to be the happiest lot. You only need to look at this photo post to believe me! 7.) It can be an awesome girls’ trip destination. 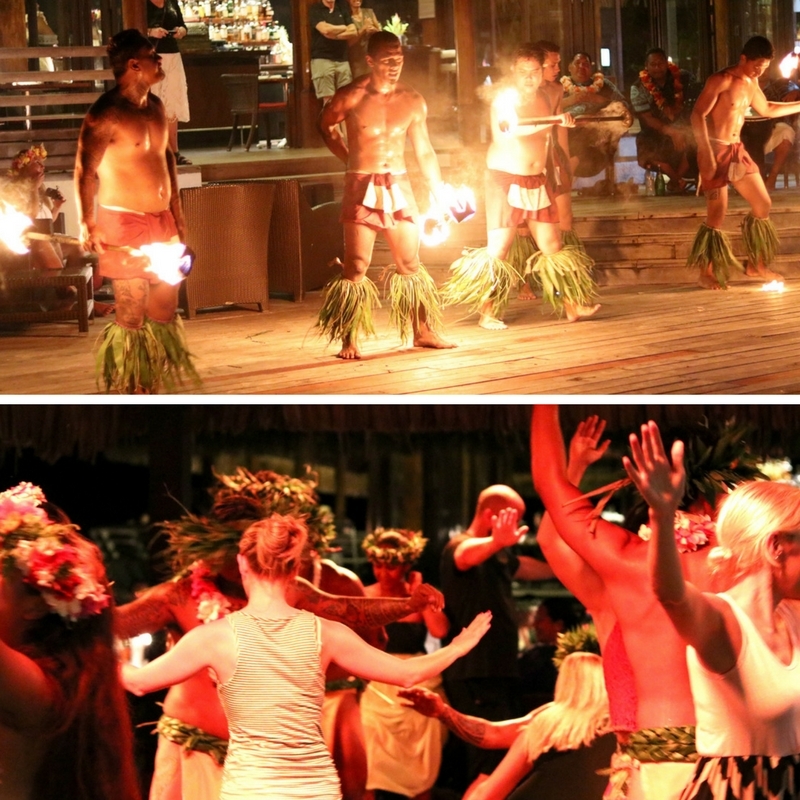 Cultural Night at Sofitel Ia Ora Moorea – Oh what a night! If you are in Moorea, a must-do activity is to have a buffet dinner at the Sofitel Ia Ora Moorea and watch their extremely impressive cultural dance show. The dinner itself is a cultural experience on its own as they serve Ahima’a – which is food prepared in the traditional Tahitian way, via an underground oven. …but let’s not forget the fact that I’m a blogger and my goal is to SHARE. And that there are two lovely ladies, Chelsey and Camille, who witnessed this entire thing and will very likely not let me live this one down if I don’t mention it. So we go to the stage with maybe ten other pairs of male dancers and ladies and it started out real easy. The moves seem pretty basic: gracefully raise your arms left and right, up and down, sway your hips every now and then. Nothing too complicated. And then the other pairs start performing in front of the audience. “We are going last,” my dancer says, holding me back. Then I notice that all the other ladies have gone back to their seats, and it’s just myself and the male dancers on stage. I start to mildly panic and look for my female posse in the crowd. One is happily snapping photographs of me while cackling, and the other avoiding my gaze while slinking further underneath the table. The lights turn down real low. And the spotlight is on us two. The dancer starts off with pretty slow moves. The next thing I know, I’m surrounded by five or six other male dancers. The drum beats become louder and faster. “What is happening??? What should I do? ?”, I yell out frantically. The next two minutes was a blur of drum beats and shiny bodies. I can’t even remember if I still managed to dance , but I do recall praying to be swallowed by the pit of the Ahima’a (underground oven). When the ordeal performance finished, I made a beeline to my table. Camille, Chelsey and I looked at each other, then just spent the next 10 minutes frantically laughing non-stop. It was one of the most heart-pounding, terrifying, hilarious and memorable evenings of my life. Oh, Tahiti! When I received the invite for this trip, I had no second thoughts at all. This is Tahiti, one of my favourite places on earth, so I kind of knew what to expect. But never , ever did I expect to have this much fun with two ladies who I didn’t even know prior to this trip. We’ve gone from exchanging pleasantries and introductions at the airport, to after just a few days, giving each other meaningful glances or raised eyebrows and know exactly what we mean without any words exchanged. Towards the end of our trip, I realised that this is exactly why you need to revisit places. Each visit is an entirely different experience and your perception of a destination changes as you uncover more sides. In this trip, Tahiti has just beautifully proven that it is more than just a couples’ destination. It has shown me that the Islands of Tahiti can also enrich ones’ appreciation of food and newfound friendship. And I don’t know about you, but that sounds just as exciting, if not better, than a honeymoon. 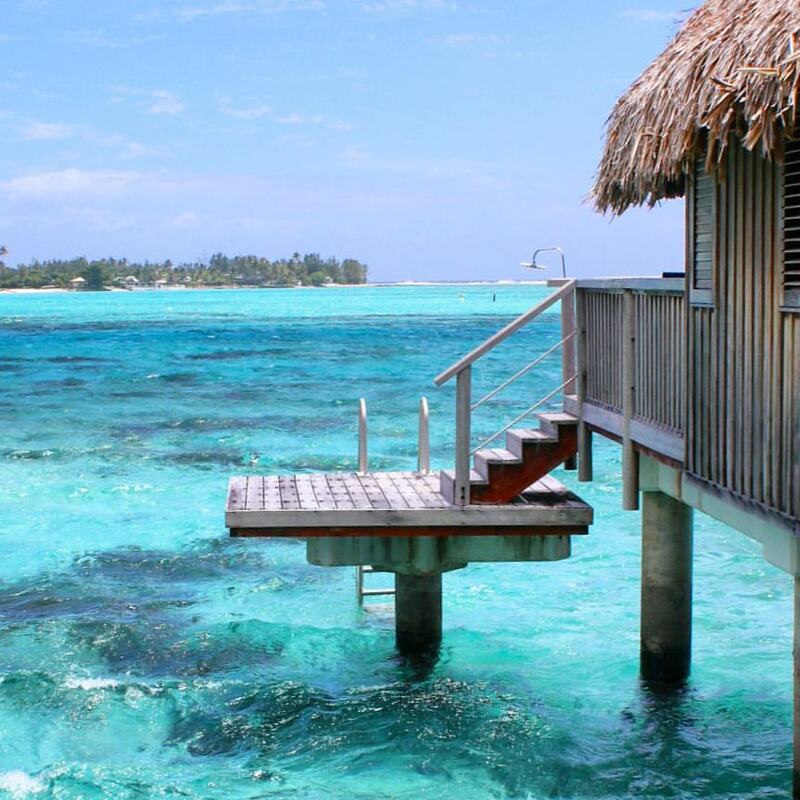 Is Tahiti on your bucketlist? Would you consider visiting Tahiti on a non-honeymoon trip? I visited Tahiti as a guest of Tahiti Tourisme, Townske App and Air Tahiti Nui. Oh did you win the Townske competition Jean?I heard that they were doing one! Tahiti looks beautiful. I would love to jump in with those sharks. 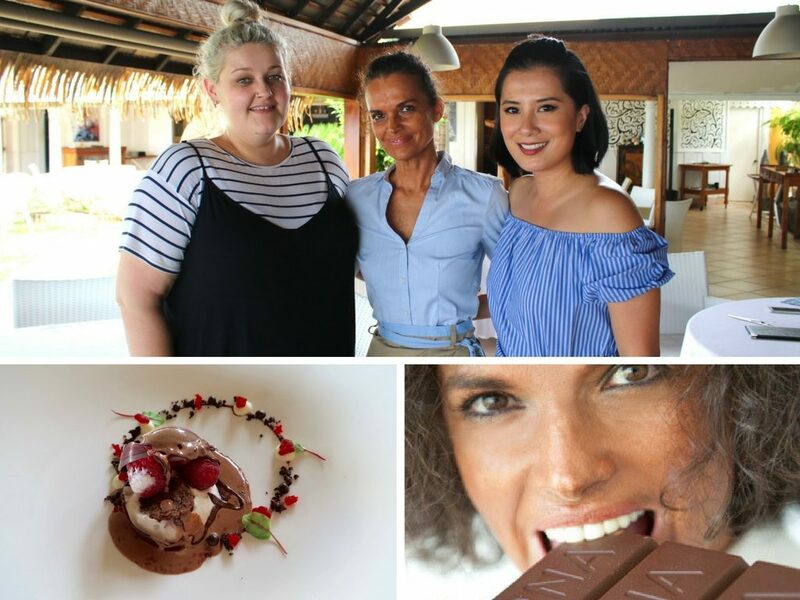 This all looks fabulous – Tahiti has always been top of my Places To Go list and now I want to go more than ever, not least because of the Snickers ice cream! That’s the ultimate girls getaway! Tahiti would be a DREAM destination for me! I feel like it would be quite an expensive trip though. How did you feel about the costs of accomodation/food/transportation while you were there? Hi Brianna! Tahiti can be expensive that’s true however on my second visit now, I realise that there are many options to save on the cost. 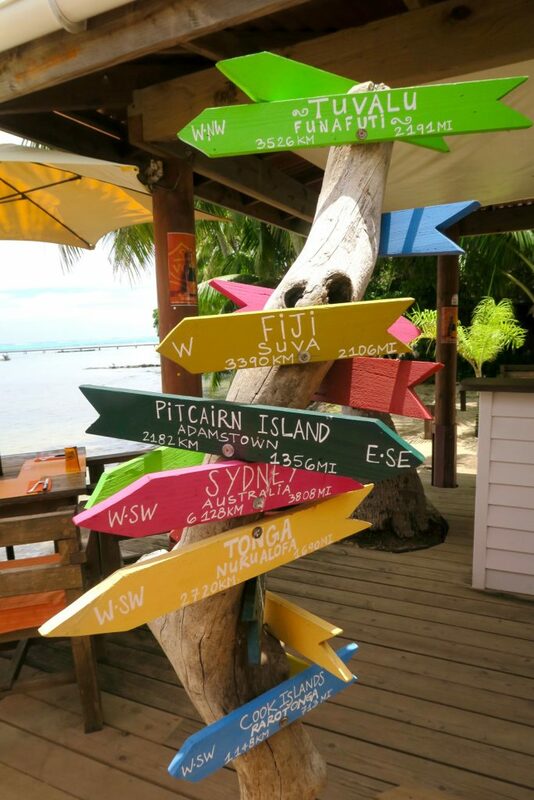 I will create a new post regarding that – accommodation options in Tahiti. Tahiti looks so beautiful and fun! Great job highlighting so much of what it has to offer, Jean! I really hope to get to Tahiti someday!